Travel cameras should fulfil two requirements. First, they should be small enough so that they don’t rob you of precious space in your hand luggage. Second, they should be versatile enough so that you don’t spend the trip wishing you brought your DSLR. Panasonic’s ZS100, also known as the TZ100, ticks both these boxes, weighing just 310g and (despite being able to fit in your pocket) offering up an impressive list of features. Built around a 1-inch sensor, the ZS100 captures 20.1MP JPEGs and Raw files, giving you the option of capturing large files with plenty of potential when it comes to editing. 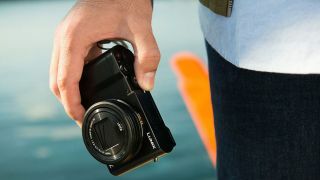 We also like that the ZS100 offer in-camera Raw processing as this allows you to edit without the need for a computer. The camera’s versatility comes from the 10x optical zoom, which is complemented by 5-axis image stabilisation to steady the f/2.8-5.9 lens – particularly useful when zoomed in, as this is when shake can be more prevalent. The 4K PHOTO mode allows you to capture an incredible 30 frames per second, with 8MP stills extracted from the burst. A hefty ISO range of 125-12,800 will allow you to shoot handheld for longer when light levels fade, and we really like that this tiny compact can capture 4K video at 25 frames per second, so you can watch high-quality footage of all your adventures. One really cool feature of note is the Post Focus option, which allows photographers to pick a point of focus after the image has been taken. This is perfect for landscapes, when you may want a little more time to decide on which focal point you want to be sharp. Furthermore, the touchscreen allows you to pick a point of focus and access menu options in double-quick time. The ZS100 is a compact that punches well above its weight, with a big zoom, many clever photo features and excellent video specs to boot. Get it in that suitcase!